I have now officially hit 500 Published posts her on Okay! Musume Time, and wow, I did not expect to ever see this amount of posts on a blog of my own... it truly is rather surreal, if you ask me. ... Now, would this be a bad time to say that I am closing this blog down? I KID, I KID!!! Holy cow, I would not do that, at least, not now! I love blogging, and I like posting these heavy picture spams for you all to read (if you read them haha! ), and sometimes I like the odd post which is thoughtful and written with some sort of intellect. I do like the random rant post every now and then, too... long story short, I love writing, and I am happy that I have written 500 posts for you all... well, kinda 500, but you know what I mean! Anyway, with this being my big 500th post and all, I thought that I would look back and post my favourite posts that I have written on this blog... because I can! Heck, I even enlisted the help of some friends to choose their favourite posts, because it's nice to know what others like and what they remember from this blog! I also encourage anyone who is willing to comment to let me know what your favourite post is on here. That all said and done, let's crack into my Top posts from my own blog, Okay! Musume Time! They are in no specific order, but hey, who cares? Let's take a look! I remember just how proud I was of myself when I posted this... really, I was very proud, because I felt like I had accomplished something and given a lot of information. I don't know if I did, but I loved this post so much, and I felt great after writing it. I really think I did my best, however much that is blowing my own trumpet... but yeah, I was proud of it then, and I am still proud of it now! This is one of my favourite PV reviews ever, and I think it's because I pretty much went full-on nostalgic in the post and poured my heart out, because the PV itself was so reminiscent of my childhood... I think that Ray helped me to love the post more when he wrote about it on International Wota. I am still very proud of this post, it means a lot to me. The PV and song are two things I still love from Sea*A as well, because it is just awesome, and wonderful to watch. I don''t think that I anticipated my Digest to last long, but it has. I wanted a place to talk about small news articles that popped up that did not require a post of its own, and somewhere to originally put polls as well, because my Poll series died. I never anticipated that people would like it, though, and now it has become a reliable post for me to do weekly. Yeah, I will sometimes wait three days before the deadline to write up the news (whoops), but I seem to still manage to keep this going... and it amazes me! I usually have a hard time staying dedicated, but this has became a post I am dedicated too, and I think it's because you guys all like it a lot, and rely on it as well. It makes me happy that you enjoy it, so thank you! I wish I had done 'A Week With...' series for Risa, but I didn't have that idea back when she was graduating, however when it came to Winky... I wanted to see what had happened to her, from beginning to end, to see where she had fallen. Okay, so I didn't look at everything she was in, but I did have a beginning (debut), a middle (where she was growing up, getting her style, but not becoming Winky yet) and an end (Winky and Graduation), and I did enjoy doing the series. It allowed me to see why people became her fans, and it also allowed me to see why some people stopped being fans because of her transition into what I guess was a 'bad' thing. I enjoyed this series, it was fun to do and allowed me to become a fan of the old Reina in a week, and also allowed me to experience the different sides of Winky. This is one of my more recent posts, but honestly... I am rather proud of it. I think that I id an okay job on it, and I like that I took a rather neutral, unbiased ground towards the video and Beckii Cruel as a whole. I know I can be rash and cruel (pun not intended) towards Net Idols as a whole, but believe me, I do like them now (haha! ), and seeing this video made me like them a bit more, and also made me want to try the writing form that is Journalism at least once. I don't know if this is a good review or not, that's up to you to decide, but I am happy with it. I guess that that is all that matters, really. Tsunku's Answer to Crack - Kare to Issho ni Omise ga Sitai PV Review + Pic Spam! Nia gave me a rather extensive list here, which surprised me... I did not expect her to post this many 'memorable' posts after I asked her to list some. That said, when she listed off what she remembered, I remember thinking 'Why that one!?' toa few of them... especially the post where I ranted about One Two Three, and also the one where I kind of celebrated the graduation of Acchan when it was announced. She's a H!P Wota, and very rarely follows AKB48, which is a funny thing to me. But, I do like her choices, because thinking about it... they are somewhat memorable. Especially the Minami one, because everyone was writing about it then, and everyone - and I mean everyone - was looking up this chick who had shaved her head for the sake of a group. Dedication at its scariest, I say! I do like that Momo has also included my H!P Subtitles post too, because I think we are on the same wavelength of how we passionately hate them... or not... who knows? Either way, I actually like that post because I still feel that way... as in, I hate those bloody subtitles. NAAAY! Dream A Colourful Dream with Dream5 in their new PV 'We are Dreamer'! The final person that I asked was Ashley, or Asupon (or Ashrii, Ashlet... I give her lots of names) and of course, I was prepared for what post she would pick, because she does love her Dream5 a lot... especially Mikoto, that cutie pie... so I was prepared for her choice, and of course, I was right! She did indeed choose one of my more recent PV reviews, and also the one that holds my biggest count of screen caps (107!!!) because... well, she loves the group! She also mentioned that she liked my mad, random storyline I threw in there for the laughs as well, so bonus points!!! I love the PV too, and the group as well... I wouldn't have reviewed it otherwise! Okay, so that is all ma peeps, the Chimian Army, who have given their Top Posts, memorable or favourites... and it was really nice to find out what they liked, to be honest. It's a pretty darned diverse list, in my opinion, and I do like that. There were a few surprises in there, some that make me quirk the eyebrows, and others that made me giggle because I did not expect them to be there. Oh, and before I go, I guess I will post my (current) All Time Posts of Okay! 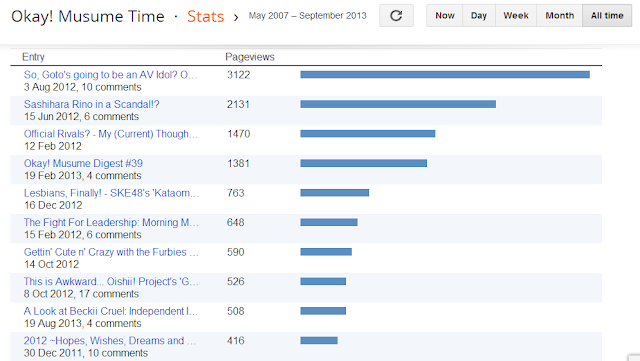 Musume Time that hold the highest pageviews here! Wanna see? Do ya? Well, take a looksy!!! The only post(s) I question are the Furby ones (though furbies did come back into 'fashion' and all) and the Hopes, Wishes, Dreams and whatever else post. Really, why them? xD Either way, this is a mixed bag, and I do like it... shows that I have a different amount of fans from different fandoms looking at my blog, ya know? Which is what I like! Anyway, that's gonna be it for now... I had fun finding posts I loved writing and also finding out what others enjoyed reading! And if you have a post you enjoyed that is your Top O!MT post, be sure to tell me! 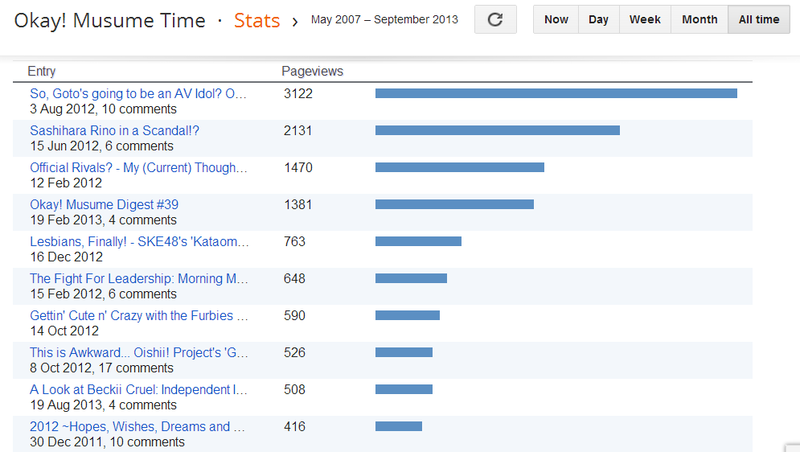 It's fun knowing what people like to read, even if I am a weird, nonsense-filled writer! Post #500 and still counting... here's to 500 more, Chimian Army! Thank you all for reading, commenting and, most of all, sticking by my weirdness and nonsense! I love you all! ;) KAMPAI!!! Congrats on 500 posts! That's so cool! I think it's also kinda crazy how half of those were in 2012. XD But that's about the time that I found your blog and I've really enjoyed it so far. Okay, sometimes I skip a few posts because I'm too lazy to read the long picspams, or I get tired of the amount of cuss words (haha, don't judge me for that please!)... but really your posts are just a lot of fun to read and you're actually the only blogger that I still actively follow anymore. And I might have told you this before, but you really inspire me to be more consistent and also adventurous with my writing. Haha I did love AOA Get Out, and still do. I listen to it a lot and even showed a few people in college the video to show them the movie references, and a lot of people said it looked good and that the song was nice, so it was a winner for others, too :3 It is such a GOOD SONG! OMG!!! Thank you, thank yooou ;w;! And I actually aim to say something about comments, well regular commenters, in my 200,000 pageviews post when I get there... yep XD PLANNING AHEAD, YO!